Tom Kerridge’s Best Ever Dishes: a weekend short-rib | WTF Do I Eat Tonight? You may know Tom Kerridge from the telly or, if you’re very lucky, you have eaten at his two-Michelin-starred pub in Marlow. As a non-telly-owning freelancer neither applies; I learnt about him via my lovely friend Debora who, when editing and recipe-testing his last book, invited me round to try out some of its delights. And, oh, what delights they were: sticky drumsticks, duck and watermelon salad, roast red pepper soup with anchovy salsa and, possibly the greatest chocolate pudding ever, chocolate cakes with orange mascarpone. I put the book on my Christmas list long before it came out and, aha, my gorgeous nephew bought it for me. For someone like me, who wants quick, simple and cheap, it at first seemed, I have to admit, like a book that might become a tad dusty on the shelf: the recipes are quite complicated, often take a couple of days and require Ottolenghi-long lists of ingredients. But, having tried some of the results in the summer, and remembering the sheer depth of flavour, the inventiveness of some of the combinations (that pudding is worth the price of the book alone), I got my Post-it notes out and started to read. I was not, am not, disappointed because, like Peter Gordon’s books, it soon became clear that this is a great, strident, breath of fresh air: you will find practically nothing in here that is derivative or has been done before and tons of new ideas, things to bring life to your cooking and palate. A quick scan will bring you celery soup with poached egg, the best, most practical ham and cheese toastie ever (another recipe worth the price of the book alone, if you have a freezer…), whole satay chicken, sardines with warm tomato sauce and smoked chicken stew. In amongst the recipes are lovely, quick tips and sauces that anyone could make and use: burnt onion ketchup, crunchy chickpeas and vodka crème fraîche. Little by little, I worked out, doh, that one of the best ways to approach the longer recipes was not to try making the whole thing but to cut them down and make something more WTF-friendly: shorter, quicker and yet still delicious. Which is how I found this short-rib recipe. One that I’ve made, ooh, about three times since I discovered it. One that I am sure I will be making forever. 1. The day before you want to eat this, crush the bay and juniper together in a pestle and mortar, and peel and grate or finely chop the garlic. Strip the leaves off the herb sprigs and roughly chop them. 2. Mix the bay, juniper, garlic, herbs, peppercorns, salt and sugar together then rub all over the beef, on both sides. 3. Put the beef in a lidded plastic container or bowl, seal/cover and leave in the fridge overnight. 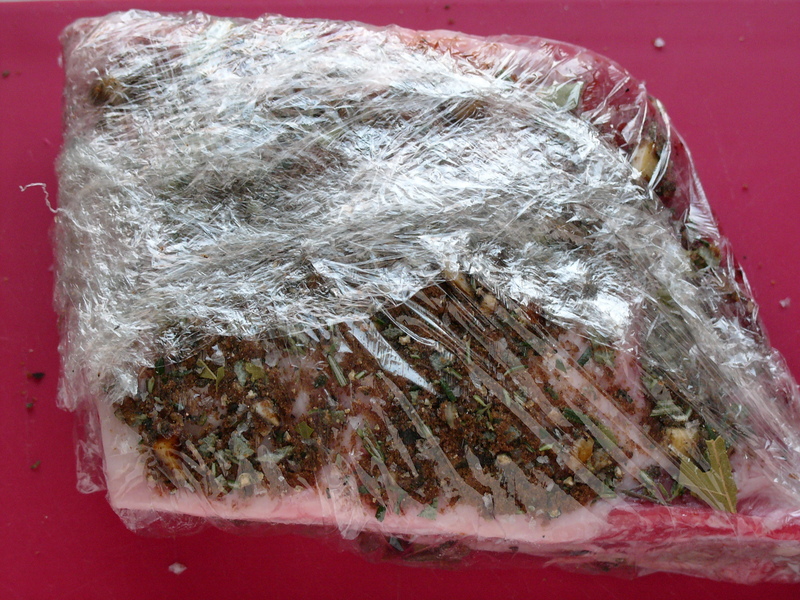 You can also wrap it tightly in cling film, as per the picture below. 4. The next day, preheat the oven to 160°C/140°C/gas 2½. 5. When the oven is up to temperature, put the beef (sans cling film, if used, obviously), cider and stock in a large, lidded casserole, cover and put in the oven for about 3½–4 hours, until the beef is very tender, checking every so often that there is still some liquid in the pan. Add more stock or just hot water if necessary; it shouldn’t boil dry. 6. Once tender, remove the lid and cook in the oven for another 30 or so minutes, so that the beef colours a little. Baste with the remaining liquid every so often, to give it a nice glaze. 7. Remove from the oven, cover with foil and rest for 30 minutes before serving. This entry was posted in Beef recipes, One pot, The new frugal and tagged BBC Food and Drink, Debora Robertson, Nigel Slater, one-pot, ottolenghi, Peter Gordon, Tom Kerridge. Bookmark the permalink. Do the cider & stock cook down to a glaze , or do they make a sauce?